Roman Polanski | WHAT A FEELING! One of the things Roman Polanski is so good at (and, as one of the world’s finest film artists, Polanski is good at a lot of things) is capturing the look and feel of a certain locale. Especially cities: the London of Repulsion, the New York of Rosemary’s Baby, and especially the Los Angeles of Chinatown. This is all the more remarkable since so much of Polanski’s work takes place in claustrophobic interiors. Now, Polanski tackles Paris, which has been his home base since he fled the United States on that nasty morals charge more than a decade ago. The film is Frantic, and it’s an exercise in the Hitchcockian form, co-written by Polanski and Gerard Brach. A visiting American doctor (Harrison Ford) loses his wife (Betty Buckley) in the first hour of their stay and Ford is forced to scour the city to find out why this happened and how to get her back. “Cherchez la femme” is the phrase of the day. Polanski is our greatest purveyor of anxiety and dread, and this effective setup allows him to draw out all the disoriented helplessness of Ford’s situation (the film’s first line, and overriding theme, is, “Do you know where you are?”). Naturally, Ford speaks no French, and just as naturally police and American Embassy officials are no help. Polanski takes delight in throwing the poor chap to the werewolves of Parisian nightlife. As Ford pieces some clues together, he’s drawn to the nightclubs and especially to a girl (Emmanuelle Seigner) who holds the key to his wife’s disappearance. Seigner is another of Polanski’s lovely young protégées (like Nastassja Kinski and others); she’s even poutier than usual, but she fulfills her role capably. Although Frantic is adequate in expressing the increasing mania of the husband, it’s not really an actors’ movie. This is a director’s film, and Polanski has some terrific moments, such as Ford’s crawl across an apartment roof (unexpectedly played for laughs), as well as two separate hostage exchanges, nail-biters both. And the opening scene, when the doctor and his wife settle into their swanky hotel, is eerily deliberate, as Polanski establishes the normalcy just waiting to be broken apart. Time and again, Polanski displays his characteristic scrupulousness. Each camera placement draws the maximum possible effect, nowhere better demonstrated than the moment the lady vanishes; the camera is in the shower with Ford looking out while the water drowns out the woman’s words and she disappears. For all that is good about Frantic, I have to admit it’s a disappointment overall. It doesn’t go far enough; there’s something minor and bland about it, and the central character lacks the sort of depth and ambiguity that have marked Polanski’s characters in the past. 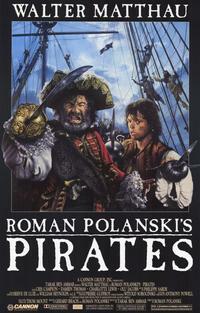 It is, nevertheless, an advance over Polanski’s previous film, the misbegotten Pirates. Well, it seems there might have been another sentence there at the end, but what happened to it I don’t know. This film really has not stayed in my mind in a significant way; even the oddball Bitter Moon left more of an impression on me. But the opening hotel sequence is a great Polanski set-piece: “nothing” happens, and you feel utterly creeped out by all of it. He married Mme. Seigner, of course.